Taiwanese celebrity, Barbie Hsu (徐熙媛) makes less public appearances since becoming a mother and manages to regain her body figure before making a comeback last year. Firstly, she participated in a reality show (幸福三重奏) with her husband, Wang Xiaofei (汪小菲) and hosted a beauty show (Beauty小姐). Lately, Barbie was invited to a brand event with Tiffany Tang (唐嫣) who was married not long ago and Xiaofei defended his wife when the netizens made harsh comparisons between both of them. During the activity on that day, both wore blue dresses and Barbie had water retention on her face, while Tiffany appeared young and slim. Thus, she was harshly criticised and some netizens described Tiffany had better facial features than Barbie. 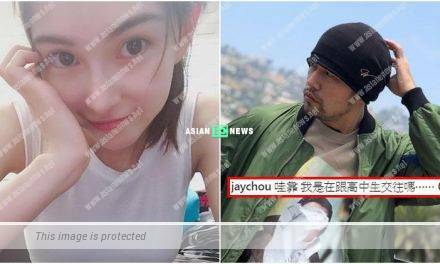 As Barbie was “attacked” by the netizens, Xiaofei decided to defend her by sharing 4 photos of his wife and replied to the criticisms: “A mother of two kids with thick hair and firm skin. She feels happy to look after the children and is full of love with the supports from her family. Inner beauty is the most important.” With the strong support, he received compliments from the netizens. Some pointed that Xiaofei also emphasised Barbie was a natural beauty and did not go under the knife. However, she told him to delete the sentence as afraid of offending other female artistes. Who is Charlene Choi’s favourite partner for travelling?